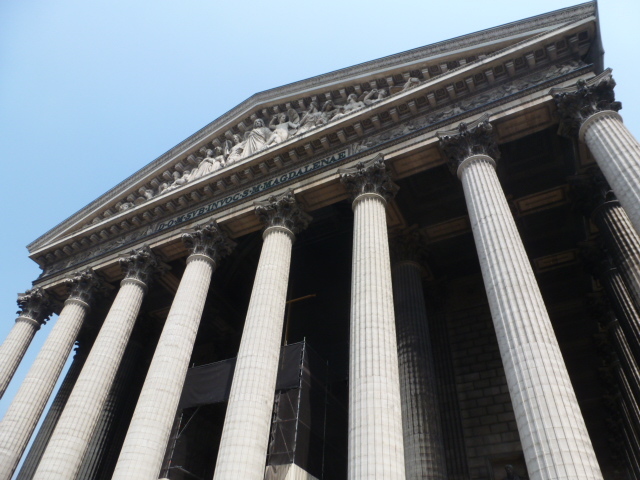 I love the church that Parisians call La Madeleine. It’s different. Just look at its façade: Greek columns line the perron that wraps around the entire perimeter of the church while the Last Judgment towers across the length of the pediment. The exterior walls of the church house statues of various saints and personnages of the Catholic faith, like this one of St. Genevieve, the patron saint of Paris. The faithful believe that her call to the city’s inhabitants to pray instead of evacuate prevented the city from being sacked by the Huns back in the fifth century A.D. I would be remiss if I didn’t show you this one of St. Luke. 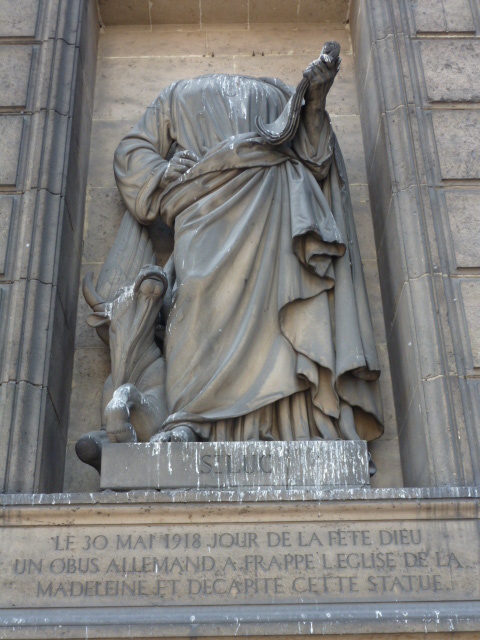 The inscription explains that the statue was decapitated by German shells on May 30, 1918. The interior of this church is unique, too. Its only natural lighting comes from three cupolas in the roof – no stained-glass windows for this belle. 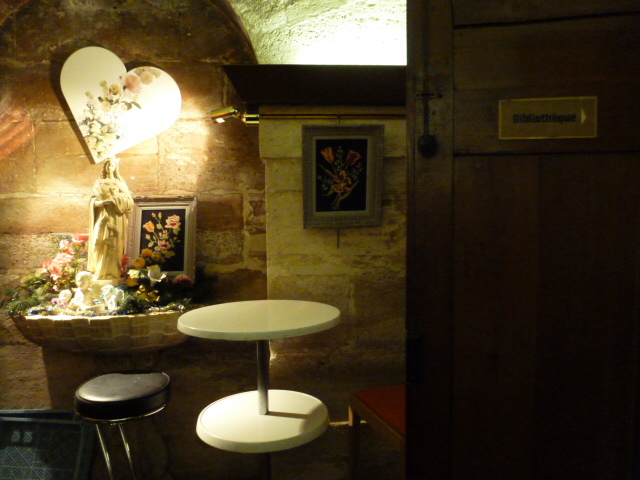 Now let me tell you about my favorite quirk of this quirky church: Le Foyer, the restaurant secretly tucked beneath the church itself. Because the perron is raised ten feet off the ground, there is plenty of room under there for a café. And not just any old Parisian brasserie – no, Le Foyer is affordable at only eight euros for a three-course meal, and only seventy centimes for an espresso. Those prices are unheard of in Paris. This restaurant is a well-guarded secret in Paris, and many of my French friends didn’t even know it existed (until now – oops! Guess the word is out!). This church is different, for sure – but different is good.